Every time you eat something or pick up your phone to call up someone or buy clothes from a shop, have you ever wondered as to where these products come from? Are you aware that every finished good or product that is ready for use has to travel a long journey right from the point of its’ origin till it reaches the customers? In other words, a chain of several interlinked elements also known as the ‘supply chain’ plays a significant role in delivering these products. However, increased globalization has led to a more complex supply chain ecosystem, which has made it all the more difficult to manage it. While the management of supply chain has become an industry in itself with the industry witnessing a phenomenal double-digit growth year on year, there are several issues that continue to plague the industry. Research report shared by Gartner reveal that the Supply Chain Management (SCM) market is expected to exceed $19 billion by 2021. Archaic Technology Infrastructure: The existing technology infrastructure used for managing the supply chain fails to fulfill the growing complexities and interconnectedness of the current supply chain ecosystem. Lack of Transparency: Fragmentation of data in silos within a supply chain ecosystem results in information asymmetry. This makes it all the more difficult to ensure the integrity of products moving across the supply chain leading to issues such as counterfeiting, contamination and more. Increasing Customer Demand: Customers today are more conscious about the quality and integrity of the product they are using. This has built additional pressure on the stakeholders who are now looking for robust solution that can do away with all the pain point of the supply chain ecosystem. How Can Blockchain Streamline Supply Chain Management? Since, Supply chain management includes planning, as well as the implementation of complex processes, it is important to ensure its proper implementation, which may lead to benefits such as increased sales and revenue, reduced frauds, and better product quality. While this might appear to be simple, maintaining a supply chain in reality is an extremely tedious task due to lack of proper connectivity amongst the different elements of supply chain. Blockchain-A distributed ledger technology has turned out to be a game changer for managing the supply chain ecosystem. In fact, several leading players are leveraging the potential of this technology by implementing it in their business supply chain. Sweetgreen, a salad chain, based out in the US has leveraged blockchain technology for managing their supply chain. According to company’s CEO Jonathan Neman, implementing Blockchain technology allows every participant of the chain to have access regarding the provenance, as well as the status of food item during its journey across the supply chain. Tracking Provenance: Multiple components and elements make a supply chain extremely complex. Consequently, it becomes very difficult to keep track of each and every record. This lack of transparency impacts the financial, as well the business reputation of the organization. With an iOT powered blockchain system in place, record keeping, and tracking provenance becomes easy since data regarding the product can be retrieved through the help of embedded iOT sensors and RFID tags. With such accurate provenance tracking, several fraudulent activities such as counterfeiting etc. can be eliminated. Cost Reduction: One of the major benefits of leveraging Blockchain in supply chain management is reduction in overall cost of the items in transit. This becomes possible because Blockchain does away with the need for intermediaries/ middlemen who otherwise consume a major chunk of revenue within a traditional supply chain ecosystem. With a Blockchain based system in place, risks pertaining to fraudulence, product duplicacy etc is significantly reduced while efficiency is improved. Increased Trust: The only way to streamline supply chain operations is by establishing trust amongst the participants of the supply chain. Since, records once uploaded on Blockchain is immutable, it cannot be tampered with. This helps in establishing trust amongst all the participants as Blockchain follows a consensus mechanism wherein consent from each and every participant is gathered before any sort of changes could be made. Increased Data Interoperability: One of the most interesting benefits of this technology is that it allows more data interoperability. This makes it simpler for businesses to share data with (manufacturers, suppliers, and retailers) each and every supply chain actor in a transparent way. Such a transparency helps curtail delays and disputes thereby ensuring smooth transition of goods across the supply chain. Since, products can be tracked in real-time, chances of loss and fraudulence becomes rare. The value of integrating blockchain technology can be understood from the fact that it offers the potential to link different ledgers while upholding the integrity of data amongst multiple supply chain participants. Furthermore, the properties of immutability and transparency make Blockchain a go to solution for managing the complexities of a supply chain ecosystem while maintaining its integrity. One of the key drivers of the global economy is the manufacturing industry. According to the World Bank, this industry itself accounts for nearly 17 % of the global GDP. Unfortunately, the industry has always been plagued with several problems including quality control and inefficiency. Apart from this, complex and disconnected supply chain has allowed fake and counterfeit products to make their way into the market, leading to lost consumer trust and brand reputation for businesses. Also, increasing customer expectations are placing more pressure on manufacturers for delivering quality products at nominal prices. Blockchain, a distributed database has the potential to radically transform the manufacturing industry by offering visibility across every aspect of manufacturing. Right from sourcing, procurement and dealer quality to operations such as machine-level monitoring, Blockchain can pave the way for a completely new business model. Blockchain can be leveraged by manufacturing businesses for streamlining their supply chains that make up for their business foundation. The distributed ledger architecture of this versatile technology can help businesses improve supplier order accuracy, quality of product, trace the origin and track the journey of products across the supply chain. This will help manufacturers ensure quicker turnaround time, augment product quality and sell more. Tracing the actual origin of a part (used for manufacturing a product) right from the point of production through the retail is difficult and cumbersome. This is because it includes multiple processes such as creating technical documentation, acquiring industry certifications and timestamps and quality checks, which are further plagued with errors. An iOT powered Blockchain based system helps in asset provenance thereby enhancing transparency and traceability for the participants of the value chain. The data gathered from the iOT sensors, when fed into the Blockchain besides allowing for a shared view also ensures that no gaps in asset handling has occurred as movement of goods across the supply chain is immutably recorded on Blockchain. Unlike the existing supply chain ecosystem that is administered by a centralized authority for verification of records, Blockchain provides a decentralized platform where data could be accessed by every participant of the supply chain. Since, provenance is proved, and data gets immutably recorded as a product moves across the supply chain, intermediaries could be removed as they increase complexity, provoke delays, and increase costs. Multiple financing of invoices has become a major contributor of increased supply chain finance costs due to the risks associated and the diligence required to reduce the risk. This primarily happens due to lack of transparency amongst the participants of the supply chain including manufacturer, supplier, insurer, finance providers etc. Blockchain can be leveraged for tokenization of invoices, which not just prevents multiple financing but also ensures cost savings. This happens because each invoice that is distributed across the network is timestamped with hashes and is provided with a unique identifier. Inefficient procurement of products account for huge financial losses. This happens due to inefficient and complex supply chain processes that expose an organization to risks and unwanted expenses. With a Blockchain powered solution in place, manufacturing companies can streamline and automate their supply chain, which speeds up the order and processing of payment for improved cash-flow and profitability. Yet another issue that plagues the current business ecosystem is the lack of transparency in processing of payments. Also, the presence of multiple parties involved in verifying and sending payment results in delayed payment to manufacturers. Blockchains’ smart contract functionality automates the payment process thereby ensuring quicker and guaranteed cash flow to the manufacturing suppliers. In a nutshell, we can infer that Blockchain is poised to revolutionize the otherwise scattered, slow moving, insecure, manual and paper-based system to a digital, secure, quick and automated network that can be operated on a single platform. Over a period of time, we can expect Blockchain for process alteration, asset sharing, supply chain tracking, warranty management and more. 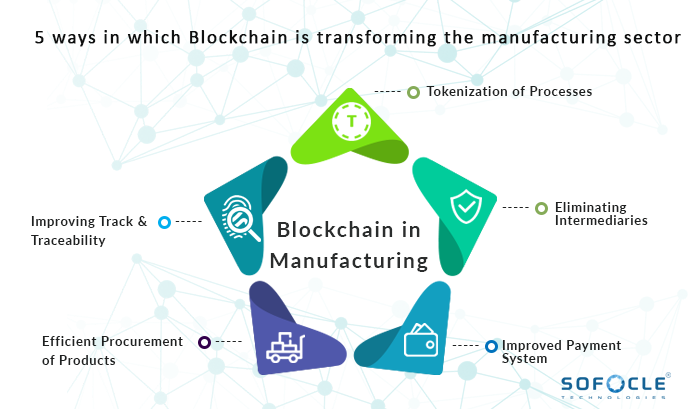 Eventually, the end-game will be when Blockchain itself will retreat into the fabric of the complete manufacturing process thereby creating a scenario where supply chain can aptly be called as demand chain and the manufacturing processes becomes decentralized. The automotive industry is moving quickly towards an era of intense change. In fact, the future of this industry will be starkly different from that of today and will soon be more than just an industry about vehicles. However, the current industry landscape is exposed to certain challenges such as counterfeiting, lack of transparency, inefficient recall management and more. These challenges have pushed businesses to fine-tune their supply chain strategies and operations, as an optimized supply chain can prove to be a critical element that can set businesses (automakers) apart from their competitors. The Life Sciences or Pharmaceutical industry has been struggling to deal with the challenges related to drug counterfeiting and ineffective supply chain management. Apart from this, it is also combating the high cost of bringing new drugs to the market, along with new standards. As a result, preventing theft, counterfeiting and forgery, while minimizing cost and improving compliance has become the utmost priority for pharmaceutical and biotech companies. To remain competitive, businesses require adopting a game-changing technology that can resolve most, if not all the current issues associated with compliance and traceability. Blockchain, the underlying technology behind Bitcoin has established itself to be beneficial for plethora of industries. To start with, it has revolutionized payments and settlements in the financial domain. Following that, it is impacting other areas of finance like lending, wealth management and insurance. Out of this, Supply Chain financing forms an interesting use case as it is part of Supply Chain Management (SCM) which itself is undergoing major disruption.